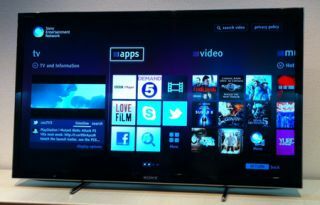 Sony to implement smart user interface on 2012 Bravia TVs | What Hi-Fi? It's all been about smart TV and networking at Sony's press briefing this morning. The company's 2012 Bravia tellies will be the first to feature a new graphical user interface (GUI) for the Sony Entertainment Network (SEN). There'll be a dedicated SEN button on the remote to give instant access to the onscreen menu, which will feature the TV image playing in a window on the left-hand side and all your apps on the right (see image above). You'll have access to Video Unlimited, Music Unlimited, BBC iPlayer, Skype, Facebook, Twitter, LoveFilm and more. Your social network feeds can run vertically down the right side of the screen while watching the TV, or run ticker-tape style along the bottom of the screen. Sony's 2012 Blu-ray players will also get the SEN interface, but it won't be possible to upgrade 2011 TV or BD models to receive it. In other developments, Sony has further enhanced its smartphone remote app which enables users to 'catch and throw' digital content such as videos, music and photos from a phone or tablet to the TV. Equally, you can now 'catch and share' web content between a smartphone/tablet and the telly. There's also a new, bespoke user interface for YouTube with easy search for HD and 3D videos, which will be released this summer. And the main programme EPG (electronic programme guide) has been given a makeover to pull in richer information from the web. It will be released as a network upgrade this summer, again only for 2012 models. Finally, we got a demo of the forthcoming Google TV set-top box first seen at CES and due for launch in Europe this summer. It's based on the US version which launched in 2010, but is much smaller, and has a radically different controller, a touchpad which allows you to 'tap, click and pinch', an accelerometer, Qwerty keyboard on the back and a microphone for search voice control. The microphone version will only come with the more expensive Google TV box with built-in Blu-ray player, not the streaming-only model. One neat app, called Airtight, brings Apple iOS AirPlay functionality to Google TV.